Hiya guys! Even though I have been feeling really under the weather again, I am still super happy about today's post. That's because my best friend Cheyenne of CDBNails and I are starting a new bi-weekly segment together! We will be taking turns coming up with the designs for each installment and this first week was Cheyenne's turn. Here's my attempt at the design that Cheyenne came up with! Doesn't this look make you completely ready for summer time?! I know Spring pretty much just started, but I feel this winter has lasted so long. It actually snowed last night... mother nature please get it together haha. One of my favorite things to do when it comes to stamping is to layer them over gradients. I mean really, doing gradients is one of my favorite things period I just need excuses to justify them all haha. Polishes: Pipedream Polish - Rhythm, Masquerader, and Harlequin. Look Nail Polish - Broad Stripes Bright Stars. Pueen Black Stamping Polish. This manicure is really basic and simple once you break down what you need to do. Start off with a white base coat and use a makeup sponge to create the gradient on your nail. I did about 4-5 dabs because I wanted the colors to really pop. Then I just stamped the image over my nail in no particular direction. After that, topcoat for a beautiful shine and you're done! I did make a video for you guys with voice over, really getting the hang of doing them now. Be sure to give my video a thumbs up and subscribe! Almost at the 300 mark as we continue the quest for 500 and changing the channel name. Next challenge will air on April 4th and it'll be my turn to come up with something. The pressure is on! One of the things I wish I would of done is add a bit more polish for the purple. It's the only color that I feel doesn't pop as much in my manicure. I love seeing our side by side manis, I really love how well we both did. Both manicures really flow into each other so perfectly. This is probably the closest twining we've ever done! Anyway I hope you guys like it and stay tuned for the next bestie twin challenge! WOW! 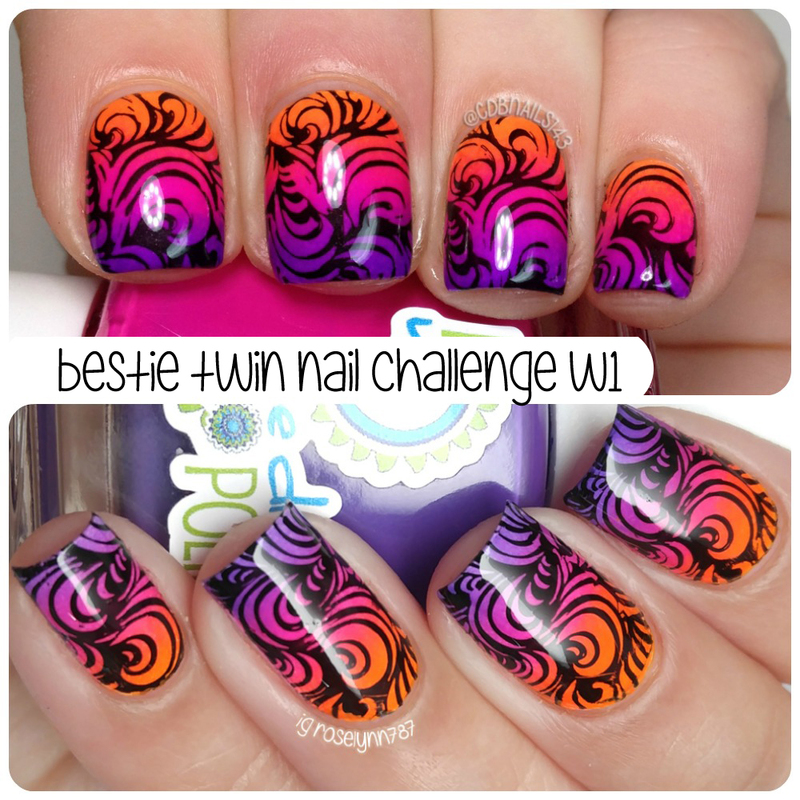 I love this nail art..Great blog! Wow! This is so pretty. You really nailed it girl. Love it! This is very tropical-looking! Nice job. I love this! I'm going to have to recreate it sometime. They're both gorgeous! I love twin manis!! That is a beautiful gradient! I love the tutorial! What for a gorgeous idea and a gorgeous outocome! I'm definitely drooling over this mani *__* Should give it a go myself too, thanks for sharing the video! Your gradients are more than welcome :D Can't wait to see what's next! These are gorgeous! Can't wait to see what you guys come up with next. We're supposed to be getting snow rain Harland freezing rain today. I'm secretly hoping the weather man got it wrong!